Also known as the ‘Sweet Gum’, Liquidambar trees are a fantastic tree, that is time develops a rounded habit. Very attractive foliage, 5 lobbed leaves finely toothed and with good autumn tones. Coming in a number of species including evergreen they are a useful tree in many landscaping situations. 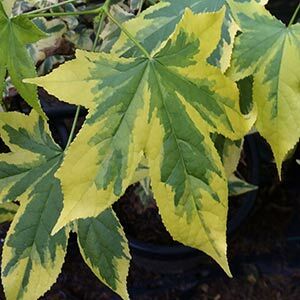 Two interesting variegated cultivars are Liquidamber styraciflua ‘Golden Treasure’ and Liquidamber styraciflua ‘Silver King’. Both with very strong variegation in the foliage. Landscaping Uses for Liquidamber Trees. Best suited to larger gardens and parks where they are grown as a large shade tree or feature tree. Placed in a position where the autumn colour can be appreciated. Smaller cultivars are suited to urban gardens. These are a tree that need to planted in the right position to avoid damage from invasive root systems. Soil – Humus rich, tolerant of poorer soil. Liquidamber styraciflua – Known as the Americam Sweetgum, this species is widely grown, a useful tall shade tree with brilliant autumn tones. Reaching around 20m in height best suited to parks and very large gardens. Liquidamber styraciflua ‘Gumball’ which will reach only around 5m in height. Liquidamber styraciflua ‘Oakville Highlight’ is another smaller growing tree to around 15m in height. Moonbeam, with wonderful golden yellow new foliage. PBM NURSERY 858 Sunnycreek Rd Trafalgar VIC 3824 ph 03 5634 7630 fax 03 5634 7619 Growers of bare rooted and potted ornamental deciduous trees, over 400 varieties, many not commonly grown. We have an extensive range of crab apples, liquidambars, Prunus, Pyrus and a number of maples, and much more. CORELLA NURSERIES Phone 03 5968 1071,0428521097 Fax 039756 7387 Wholesale nursery with a wide range of bare root semi advanced trees, deciduous ornamental trees, fruit tree stocks and potted products.